1. Preheat the oven to 190˚C, gas mark 5. Slice the top off the garlic bulb, just exposing the flesh. Place on a square of foil, drizzle with 1 tbsp oil, season and bring the sides of the foil up to form a parcel. Put on a baking sheet and bake for 30-35 minutes, until the garlic is soft when pierced with a skewer through the foil; cool for 15 minutes. 2. Bring a medium-sized pan of water to the boil. Add the broad beans and peas and simmer for 2 minutes. Tip into a colander, refresh under cool water and drain well. Slip any larger broad beans from their skins (discarding the skin). 3. Squeeze the garlic from the bulb into the small bowl of a food processor. Add the pine nuts, basil, broad beans and peas. Season and pulse a few times, scraping down the sides, until roughly chopped. Drizzle in the oil with the motor running to make a rough pesto. Scrape into a bowl; stir in the parmesan and lemon juice. 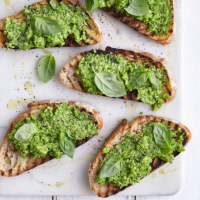 Use as a pasta sauce or spoon onto bruschetta, topped with basil leaves and a drizzle of olive oil. This recipe was first published in Sat Jul 01 09:47:48 BST 2017.